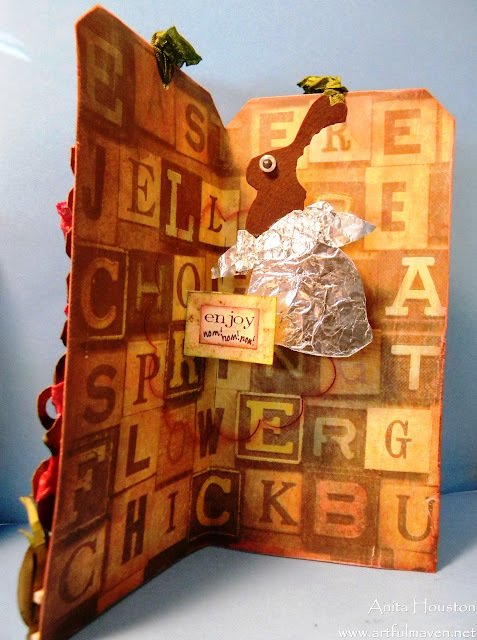 I bring you a quick post with my tag/pop-up card inspired by Tim's most awesome 12 Tags of 2013 for March. Wasn't that bunny genius with the tinsel??? I loved his tag! For my take on Tim's tag, I decided to turn the Mini Ornamental Die into a basket instead and make my die cut of a cross inside of an egg. I also couldn't have an Easter basket without a chocolate bunny, so one pops up when you open the card, even though a bite has been taken out of it...I just couldn't help it! Using a #10 Jumbo sized Ranger tag as a guide, I cut two pieces of paper into into cards by doubling the tag. 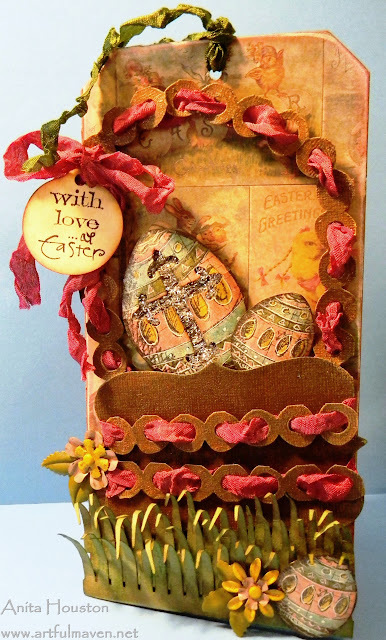 I used the Sizzix Pop Up die on the Idea-ology Easter paper for the inside. 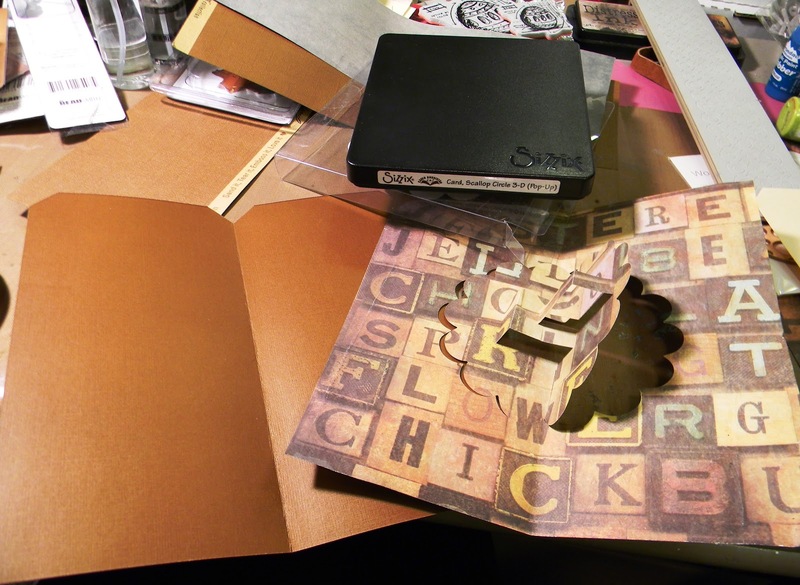 More Sizzix die action here. I cut apart the Washer Border to use as a strap and decoration for the basket. Rock Candy Crackle covered the basket, and Weathered Wood Distress Stain highlighted the cracks for a great distressed look. After I colored the seam binding I weaved it through the holes of the Washer Border. I stamped and cut out the eggs from the Blue Print Easter Sets. 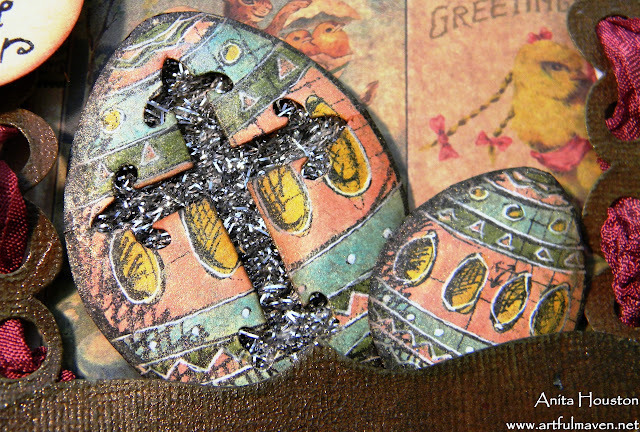 I die cut the cross into the larger egg. 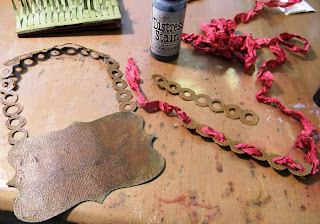 These were colored with Distress Markers and misted with Heirloom Gold Perfect Pearls Mist. 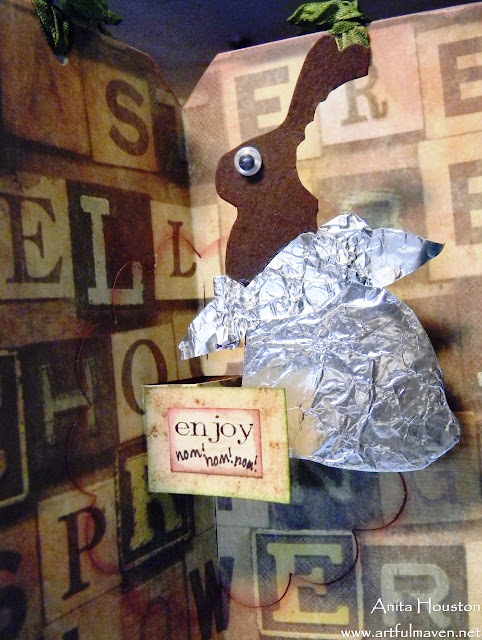 I freehand cut the toothmarks on the rabbit and covered him with foil. I am also submitting this to Inspiration Emporium's monthly blog challenge for "Add A Little Pop", and Hels Sheridan's Sunday Stamper challenge for "Shiny". Poor Mr Bunny got his ears chomped off!! Love your tag. Happy Easter to you and yours. Anita I love you tag, so clever and really creative! Fabulous!! Can I just say - "OMG!"... What an astounding piece of work, Anita - your "woven" basket is amazing, especially that handle, and I love your gilded eggs, Faberge style! 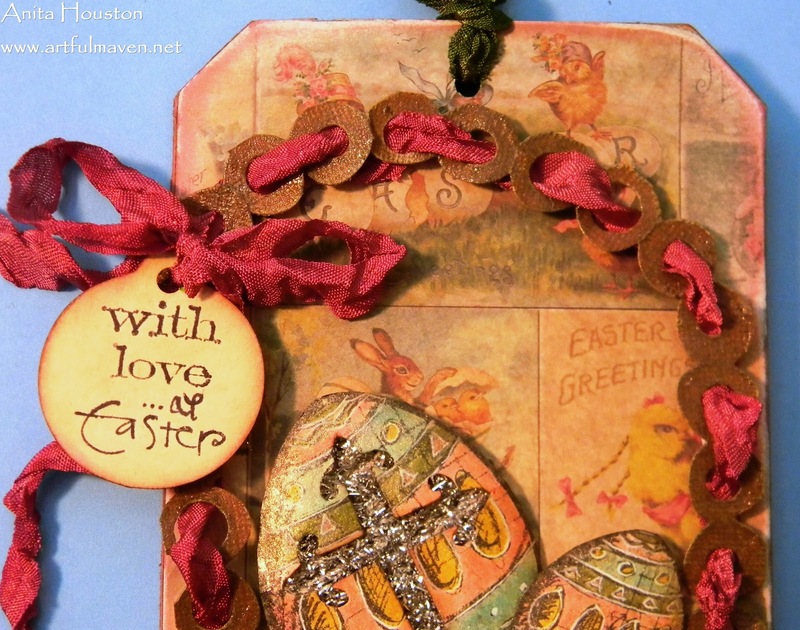 What a wonderful tag card... Hope you and yours have a wonderful Easter! 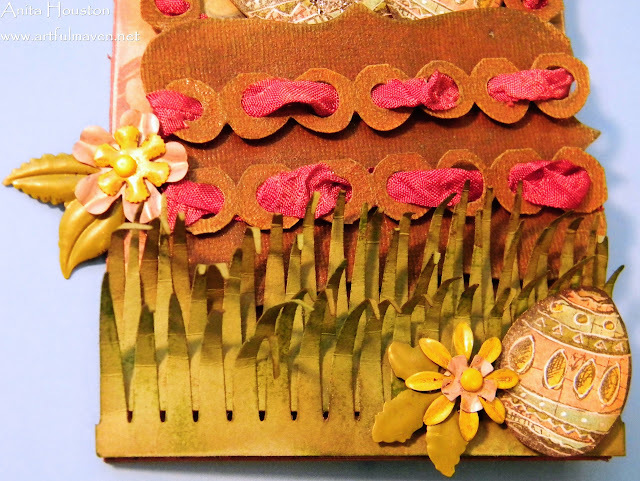 What a beautiful and fun card, Anita!! That bunny is just too cute! I love your take on Tim's tag, so very creative!! :D Thanks for the smile on my face, love the bunny looking out of the metallic foil. Your tag is fantastic. I love your version of Tim's tag, Anita. The colors are perfect together. The basket with the eggs is so cute. I love it! You certainly made it your own! Great imaginative project, and I love the Easter eggs. Love your take on Tim's March tag. Clever use of the dies. 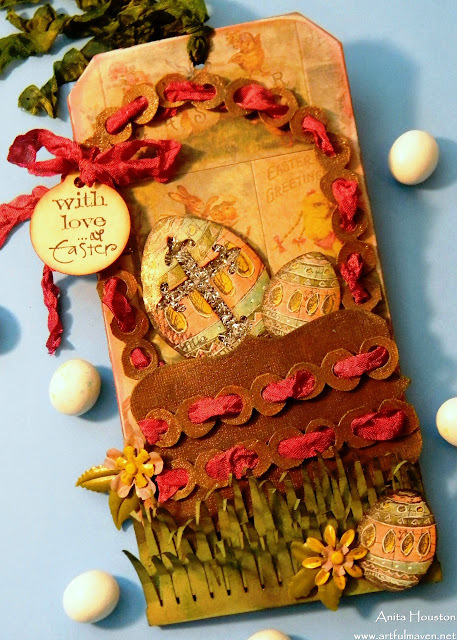 The contrast of the nice Easter scene on the front with the positively frightened bunny on the inside is so fun. Great job. 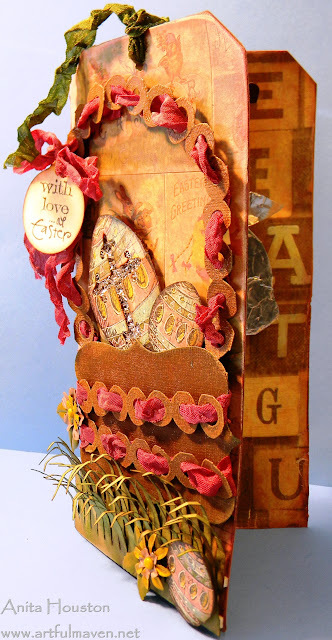 This is a beautiful and very creative tag, Anita! My favorite part is the precious and very meaningful crossed Easter Egg. 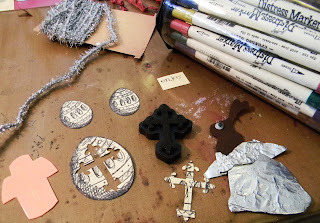 I just ordered the regular size Tim Holtz crosses, and have the miniature ones on my wish list. I believe the possibilities are endless. Blessings, my friend! This is SO cute!!! And I love the idea of the hinged tag...way cool!!!! Oh Anita, this is eggalicious! That bunny gave me such the chuckle with his googly eye and foil wrapper! You are brilliant! Happy Easter! Another out-of-this-world project, Anita! Love, love, LOVE it! Pinning!!! Love this Anita, I love the way you used the dies in different ways. So inventive and original. I also love that you made your tag about the true reason for this wonderful Holiday Season!!! Jesus!!! Amen to that!!! Gorgeous work fits really perfect to easter. Love the many wonderful decorative elements. Brilliant! Have a great Easter. Incredibly beautiful! I love the 'chocolate' bunny on the inside. Oh This tag ROCKS!!!!! I love every inch of detail you've put into this piece!!!! AWESOME AWESOME!!! Wow, I am still chuckling as I am typing this! 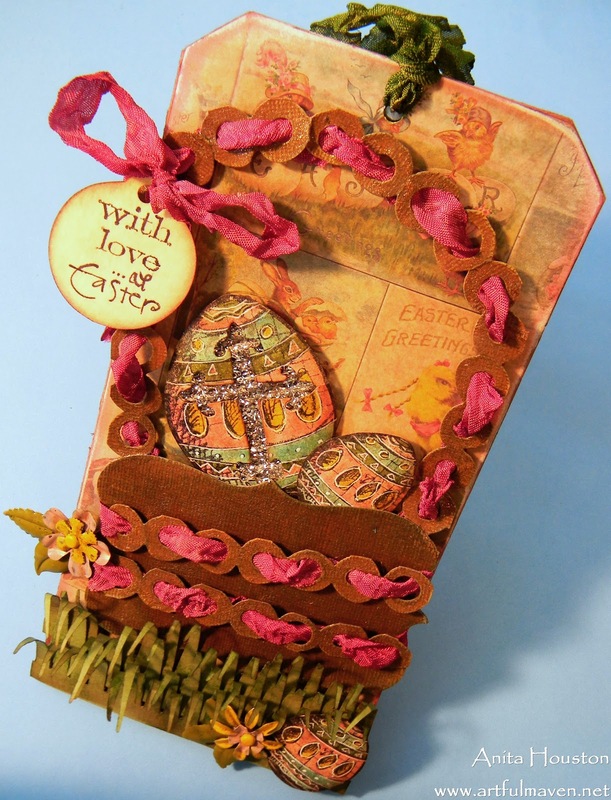 Your card is amazing, and love your basket idea and the use of the cross on the egg for Easter. When I saw the bunny with the foil and ear eaten I cracked up. So fun! The eye reminds me of the candy eyes I used to pull of my bunny as a kid. I ate them first for some reason! Thanks for sharing, and inspiring. Happy Easter to you! I'm blown away - this is so cute and the design is simply sensational! Ooooh, super creative way to use the washer border die! I love it! And the bunny with the bite mark is hilarious... so many great details on this project! What an inventive ideas for this tag-card Anita! Fabulous tag, Anita! Love that bunny inside. An awesome tag-card!!!! The front is fabulous and I love the bunny inside with the bite gone!!! This...I love!! Very inspiring piece of art and made my morning. Happy Belated Easter to you. There are so many things I love about this that I don't know where to start! That basket on the front of the card is sooo cute! And I love how you die-cut the cross in the egg. But the best part is the foil-wrapped chocolate bunny inside with part of his ear bitten off! It looks so real! LOVE that! You are a crafting genius!! Love how you used the pop-up in your tag, Anita! So cute and so clever! I didn't get to finish my tag for March in time for the challenge. I was in Baltimore helping Liz move and the clock ran out on me. But I simply adore your take on Tim's tag. I think it is even better than his. (I hope he doesn't read this!) The bunny ears made me chuckle, and your eggs are fab! Super fun, Anita! Now how did I miss this one? What a FUN tag. 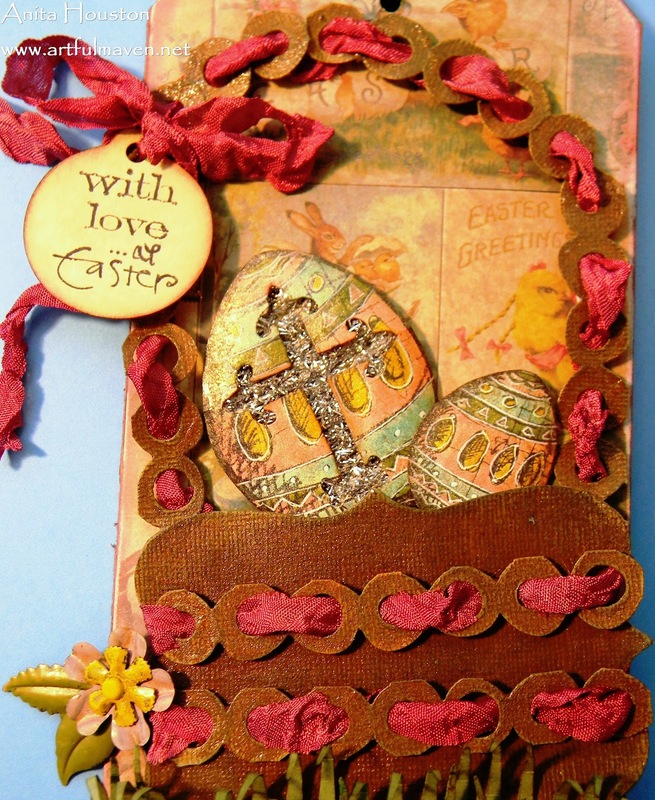 Love the sparkle hidden in the eggs and of course the bunny!